Getting into the holiday spirit, Topps will launch 12 Days of Giveaways. They will be giving collectors a chance to win 2013 Topps boxes such as Tier One BB, Finest BB, Bowman Inception, Bowman Platinum, Bowman Chrome, Gypsy Queen, Allen & Ginter, Topps Chrome Football, Topps Football, complete sets and more. Also, collectors can win autographed cards, relic cards, autograph bats, and other memorabilia. 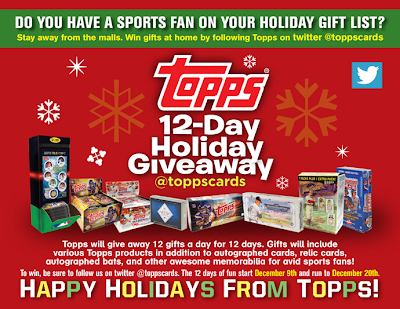 Topps will be giving away AT LEAST 12 prizes a DAY for 12 Days! There will be plenty of chances for collectors to win something. To win, all you need to do is follow Topps on Twitter @toppscards (you can use this link to get there) and look for the announcements on how to win gifts every day! It all starts Monday December 9th and runs every day until Friday December 20th! So make sure you are following Topps on their twitter account so you do not miss out!